Layoffs are reportedly coming fast to two large U.S. companies. Microsoft will announce plans to reduce its workforce, ABC's KOMO-TV reports, while American Airlines may jettison thousands of workers in its reorganization. KOMO-TV's Brad Goode reports the tech company, based in Redmond, Wash., is undergoing a major restructuring and will eliminate numerous redundancies in the marketing division. 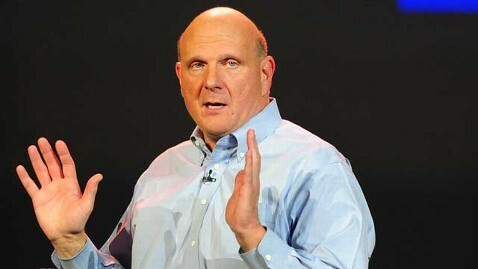 Microsoft CEO Steve Ballmer has been under increasing pressure from shareholders to improve performance. Sid Parakh, analyst with Seattle investment firm, McAdams Wright Ragen, told Goode the marketing overhaul does not come as a surprise. Parakh says Microsoft has fallen short in marketing many of its consumer products in comparison to the success seen at both Apple and Google. Earlier reports hinted at looming job cuts in Microsoft's marketing division, Bloomberg reported Jan. 11. Microsoft spent $13.9 billion on sales and marketing in fiscal 2011, which ended on June 30, up 5.5 percent from the previous year. In January 2009, on the day of its second-quarter earnings announcement, CEO Steve Ballmer announced in an email Microsoft's first-ever companywide firings, which included cutting more than 5,000 jobs. A spokesman for Microsoft confirmed the company underwent a restructuring within the marketing division that eliminated 200 jobs out of the company's 92,000. Microsoft Corp. reported flat earnings in the latest quarter due to the weak PC market. The company reported revenue on Jan. 19 of $20.89 billion for the quarter ended Dec. 31, a 5 percent increase from the prior-year period. Net income fell to $6.62 billion, from $6.63 billion. "Given the rapid changes in technology and the shifts in how our customers connect with Microsoft, great marketing is more important than ever to Microsoft's future success," the company said in a statement. "We're taking steps to improve the effectiveness and efficiency of our marketing, and to strengthen career paths for marketers at Microsoft. Some of these changes involved the reduction of a small percentage of marketing positions, to better align our resources with our business needs and clarify roles across the marketing function." Meanwhile, American Airlines' bankrupt parent, AMR Corp. is preparing to announce layoffs. Police have been placed on standby while the company meets with unions this morning, ABC-WFAA's News 8 reports from AMR's headquarters in Fort Worth, Texas. AMR filed for Chapter 11 bankruptcy protection on Nov. 29. Company executives were scheduled to meet with employees to detail concessions that they want from unions under a reorganization plan, the AP reported. Currently there are close to 87,000 employees with American Airlines and American Eagle worldwide. AMR Corp. has a loss of $904 million in December, more than in the first nine months of 2011 combined, the company disclosed in a filing with a federal bankruptcy court in New York on Tuesday. Revenue was $2 billion in December, American's first full month operating while under bankruptcy protection, the Associated Press reported.